Nigella's Banana Muffins...a new Family Favorite? The theme these week at I Heart Cooking Clubs is Family Favorites...and yes, we're still cooking with Nigella. A perennial favorite in our house is Banana Bread. Although I rarely stray from our usual recipe, I decided why not do something wild and crazy!? So, I made a different banana bread...well, muffin in this case...recipe. Gasp! And you know, we really liked it. It was different from our norm...the norm being a bit sweeter and more moist...and most of all comfortable. Nigella's version simply used honey as the sole sweetener (aside from the natural sweetness of the nanners). The flavor was understated and homey and somewhat more "natural" than ours. This actually made me wonder if the kiddos would like them as much. But I needn't have worried. You see this towering bowl of mini muffins.... ...it didn't tower for long! I made them over the weekend and between the running in and out of the house and grabbing one each time they made a pass...they made quick work of them! Thanks Nigella for expanding my banana quick bread horizons. I am not abandoning the recipe that has been a favorite for generations, but I am going to use your recipes when I make mini-muffins for sure! 1 heaping tsp. Baking Powder ...for some reason this confuses me...how heaping!? I was taught to always level, Nigella. Why do you make me pull hairs! Preheat the oven to 375 degrees F. Put the butter, honey and vanilla in a pan on a low heat to melt, then remove and set aside for a few minutes. Mash the bananas. In a separate bowl, measure out the flour, baking powder, baking soda, cinnamon and salt. 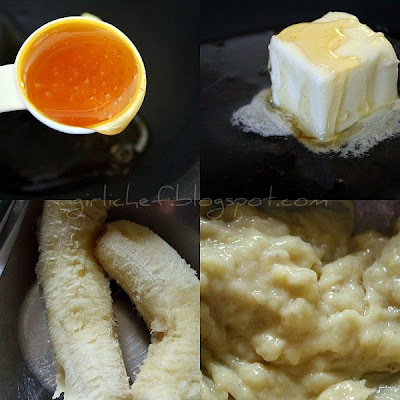 Mix the melted butter mixture with the bananas and then mix that into the dry ingredients. 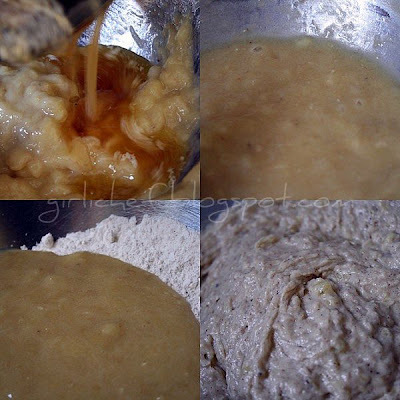 Don't over mix: just stir a couple of times; you will have a not terribly attractive lumpy sludge, but don't worry about it LOL. Put in oven and cook for about 25 minutes...um, Nigella...why do you not give a separate time for the minis? These would turn to powder in that amount of time. My minis took roughly 10 minutes. Leave in pans for 5 minutes, then remove the muffins to a wire rack to cook for another 5-10 minutes. This is what happens when I stay up late! please come over and visit-I played around with the website-thanks it is fun and I am thrilled. One more thing to spend my time doing. I love making my banana bread as muffins!! makes it sooo easy to just pop one in (and you don't feel sooo guilty, right? I mean its just like...2 bites LOL). Ok, I have a confession. 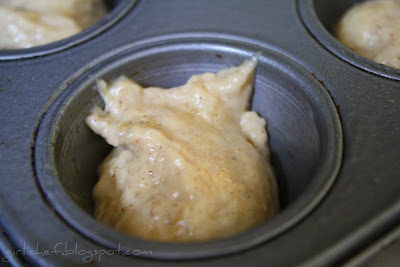 When I first glanced at the recipe title, my tired brain registered Nutella Banana Muffins and I got all excited LMAO!! then I wondered how come they were so light in color...and well, I had to re-read. sooo...Yeah for Nigella...(she rhymes with Nutalla...hahahaha) and her / your muffins look really yummy, sure to please a fella (r r r...had to finish the rhyme. )....damn good cab sauv. Ooh, mini muffins are so easy to eat. Too easy actually. In my mind a dozen mini equals one regular muffin. Like my math? I really like mini-muffins because I love the sweet "crust" of a muffin...sort of like when Lorraine on Seinfeld only wanted the muffin tops lol. It's about time I made some banana bread. I don't have a family recipe, it's not part of my tradition, but I'm dying to try this one or any other. Popping a mini in my mouth sounds so inviting. It's so hard to try out a new recipe once you get set on an old one - the evil you know is infinitely less scary than the one you don't know. But I'm glad these turned out so well! The perfect bite-sized treat. I love Nigella's recipes and this one looks like a winner. I love mini muffins and these look yummy yummy! I eat muffins like potato chips, so I would have to make up a basket to give away and leave only a few of these tantalizing treats for myself. I've never cooked from Nigella (I know, I know - cannot do all) but have all the ingredients and will try this. Easy enough to hobble around the kitchen this morning. Love the idea of the muffins instead of the bread. I agree that Nigella's cooking style on some things tends to be a bit more on the "natural" side. 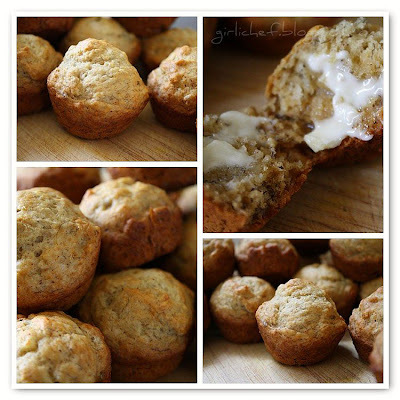 This looks like a great banana muffin recipe to try! I've watch Nigella, but haven't cooked any of her recipes. These nanner muffins look great. Definitely a healthier treat for everyone. I love these! I am trying to use more honey and agave in my baking and less sugar. Perfect yumminess. What cute muffins. My husband loves bananas so I know he would like these. I really love your photos of the process, and the tower! I can see why these didn't last long! mighty nice muffins and I dont mean that in the biblical sense! has every potential to be :)-- lovely container too ! 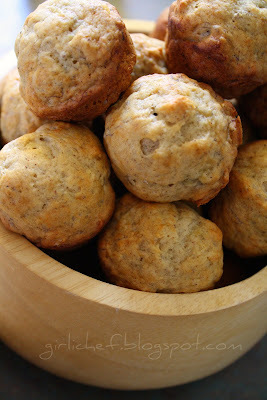 I love the crust on mini muffins and the bananas in these make them especially delicious. It's a great recipe. Have a wonderful day. 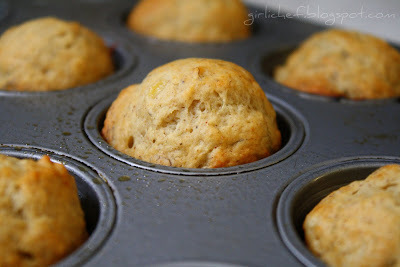 makes me wanna make corn banana muffins - am i seriously wrong, but doesn't that sound tasty too!? Yummy.....that would be a breakfast item AND a snack AND dessert in our house! oh how yummy, i bet they made your house smell like heaven. I'm a Nigella fan as well. These muffins look marvelous! Beautiful mini muffins, I could eat a whole bunch of these! Gotta love the mini muffins! They're so petite and make you feel all dainty, even if you eat 12 of them:D I love how Nigella uses honey as a sweetener, very interesting!! Great pick! These sound so good. A perfect snack or breakfast....or dessert! I love bananas, and the food made with them....your muffins for sure will be my one of favourite banana recipes! What yummy muffins! I think they sound great with the honey in them! Ciao ! I love your mini muffins but now I'm also curious about 'the other recipe' !!! I have to try these. I made banana cupcakes and my husband loved them. He thought he was going to hate them, despite the fact, that he loves bananas. Go figure men out. Since he liked them, I am sure he will like these, also and they are Nigella's to boot. I am really enjoying cooking from her book and online. Popcorn & Nuts for quick Party Food! Autumn Soup...because I can feel it in the air!